Ahem. Back to the Stollen. A perfect choice for this month, because it practically makes itself, leaving us Babes to occupy our minds with… whatever other things we may wish to occupy them with. 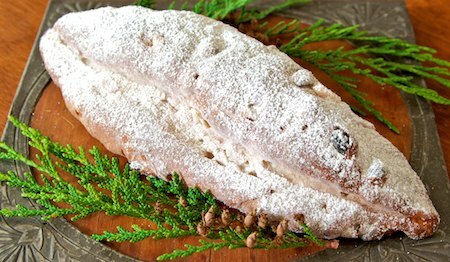 Stollen is one of my favorite holiday breads, and quite easy to make. It is a traditional bread from Dresden, Germany, and the shape is said to represent the swaddled child in the manger. You kind of have to use your imagination to see this. Mixing the dough is simple if you have a stand mixer with a dough hook, although it takes some time. Just throw the ingredients in the mixer, turn it on, and go buy a wedding dress or something.The dough will be ready when you get back. Mixing by hand is doable, but be prepared for a workout — the dough is stiff, and should be kneaded until the gluten is well-developed, which takes longer than lean breads because of the fat and sugar in the dough. 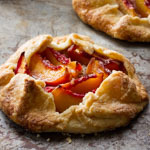 In either case, leave out the rum-soaked fruits until the gluten has developed sufficiently, then add them and mix only until they are just evenly incorporated. 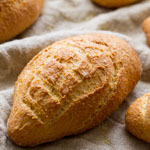 This recipe makes three loaves of about a pound each. You can make the loaves larger or smaller as you like. To shape each loaf, form the dough into a blunt batard. 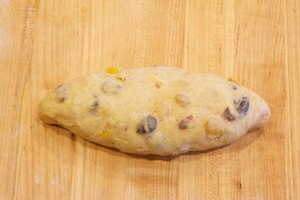 Use a small rolling pin (a broomstick or drumstick works in a pinch) to divide the dough into two sections, just off-center. 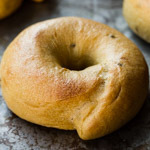 Roll a thin flap of dough about 2 inches wide (larger or smaller depending on the overall amount of dough you’re using) connecting them. Flatten the larger section slightly with your hand, and flip the smaller section up onto the larger one. It helps to overshoot the center so the small section does not fall back down during baking. To keep Jesus from falling out of the manger, seal the dough lightly along the bottom of the small section, on the “closed” side. The recipe calls for candied orange and lemon peels. I like making my own; it’s easy, cheap, and not as syrupy as what we can buy in the stores here. I like to use osmotolerant yeast for sweet breads, but you can certainly get by without it; in fact, the loaf I made here is with regular instant yeast. I’ve given the amounts for active dry and fresh yeast, too. And no, I didn’t make any typos; it really does call for a large amount of yeast! We need clarified butter for the finishing. If you haven’t done this before, it’s easy. A few tablespoons is enough for the stollen. Melt unsalted butter in a small pan. With a ladle, skim off the light yellow foamy part so you have the golden liquid part with some solids at the bottom. Either pour off the liquid carefully so the solids remain in the pain, or strain it though a very fine mesh or cheesecloth-lined strainer. Even if you have lots of other things on your mind, I hope you’ll join us by baking Stollen and being a Bread Baking Buddy. Send me the link to your Stollen by November 29 to be included in the Buddy roundup. Toss the soaker fruits with the rum in a medium bowl. Cover and leave at room temperature for about 12 hours. Meanwhile, combine the sponge ingredients in another medium bowl. Cover and ferment at room temperature for 12 hours. In the bowl of a stand mixer with a dough hook, combine all of the final dough ingredients except the soaker. Mix in slow speed until all the ingredients are incorporated. Continue mixing in medium speed until the gluten reaches full development. The dough should come together around the hook and should no longer stick to the sides and bottom of the bowl. This could take about 25 minutes or more, but will depend on your mixer. 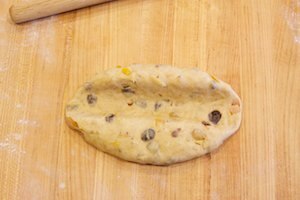 Add the soaked fruits and mix on slow speed just until they are evenly distributed through the dough. Transfer the dough to a lightly buttered container. Cover and ferment for 30 minutes at room temperature. Turn the dough onto the counter. Divide into three pieces, or however many you would like. Preshape the dough into balls and let them rest, covered, for 30 minutes. 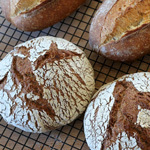 To shape each loaf: Form a blunt-ended batard and dust it lightly with flour. 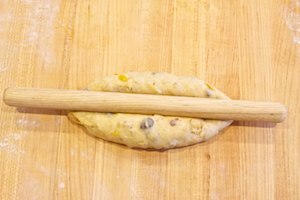 With a thin rolling pin, press down firmly, separating the dough into two parts with one slightly larger than the other. Roll out the flap of dough connecting the sections so it is about 2 inches wide. Flatten the larger section slightly with your hand, then fold the smaller section over to rest on the larger one. Place the loaves on parchment-lined baking sheets (two per sheet) and slip them into a large plastic bag with a bowl of warm water. Proof for about 90 minutes, replenishing the water when it cools. Meanwhile, preheat the oven to 375 on convection setting or 400 on regular bake setting. 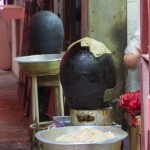 You will also need steam during the initial phase of baking, so prepare for this now. Bake for 10 minutes, open the oven door briefly to allow any remaining steam to escape, and bake for another 20 minutes. If you do not have convection, you may need to rotate the position of the baking sheets halfway through the bake to ensure even browning and keep the one on the lower rack from burning on the bottom. While the loaves are still warm, brush them with clarified butter. Dredge them in fine granulated sugar, brushing or shaking off the excess. To finish, sift powdered sugar over the loaves. Cut when completely cool. You can leave the stollen out overnight to let the loaves dry and the sugar crust up a bit. Congratulations Susan! I hope your day is special and you will have a lifetime of happiness and bread baking ahead of you. Happiest of Wedding Days today to you my dear Babe! You Stollen looks so lovely, I wish mine had turned out that nicely shapewise. but they taste delicious as my mom stated and she is a picky eater when it comes to sweet things! Congratulions on this very special day. Wishing you both all the happiness and health in the world together. We love this stollen. It was nice to use a completely different recipe for a change. Thanks Susan! Congratulations! May your marriage grow stronger each year, and may it be filled with lots of good, fresh bread. I love stolen, but I’ve never tried to do it. Thanks for the recipe! Congratulations, Susan! I wish you lots of happiness. This stollen looks wonderful! Congratulations! May the two of you be very happy in the years to come! Those stollen moments…. Congratulations! I which the two of you all happiness in the world! 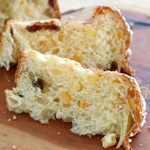 And the stollen looks very delicous – I like stollen very much, too! Congratulations to both of you! 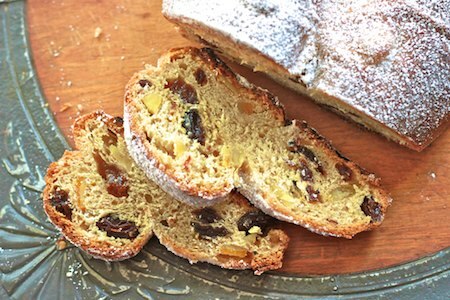 Only you would be able to bake a little stollen and then… go get married! Amazing, and cool, and wonderful! Congratulations Susan! 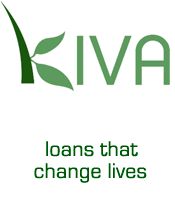 I have been reading your blog for a while, thanks for sharing so much helpful information! I wish you a happy happy wedding! congratulations!! so nice to get married around Christmas time, so cosy… and that stollen sounds simply amazing! Wishing you the happiest of days and years! This Stollen certainly delivered happiness to our house. Congratulations on your wedding day, may you have many happy years together! And thank you for the stollen recipe, it looks and sounds wonderful. Congratulations and what wonderful Christmas memories you both will have. May your lives be happy and long. Never made stollen..you make it look like MAYBE I could? It is only appropriate that you get married with flour on your dress. Happiest of days to you! Lovely stollen, such great loft to your loaf. All the best to you both for many happy years together! I truly hope you had a wonderful day Susan, have been thinking about you today… Wishing you both all the best and lots of laughter and happiness. Wishing you and Jay a happy day. A special day to remember many years to come. And when you come home there’s always your stollen! Susan you are a wonder. A) stollen is a time consuming recipe, B) it is your wedding day, C) hope you and hubby have a few stollen moments to yourselves! Wishing you the happiest of marriages and lots of bread. The Stollen recipe is wonderful. Perhaps that was powdered sugar on your dress? Hope your day was wonderful! Funny, we both love stollen, and your married…. Congratulations! I hope you had a very special day! I love this recipe and will make this for christmas! Congratulations! I sure hope you auto-posted this while you were off to city hall. I made stollen once many years ago. The recipe made 7 of them or something ridiculous and I had to borrow a bigger bowl from my neighbour. I have to say I don’t remember too much about the finished products – I gave them away as gifts. I’m pretty sure I didn’t knead the dough for that long – that I would have remembered! I would love to try this recipe but it will have to wait for a more non-traditional cold January day. I am so happy for you Susan, this Stollen will bring back wonderful memories for you each year when you bake it! I love this post so much and send you happy congratulations on your wedding! If I hadn’t just yesterday made my first ever Dresden Stollen, this would be on my list to make right away. It looks wonderful! I’ll store it away for another time. I might want to be a Bread Baking Stollen Buddy this year — I’m assuming the cutoff date is December 29 so I’ll try for that. Thank you, Susan…and Happy Holidays! Congratulations Susan on your wedding! I am so happy for you. Best wishes to both of you… What a wonderful way to end a year and start another one. This the most beautiful post Susan, I am truly happy that you found your true love. Congratulation to both of you! Best Wishes for your wedding day and many congratulations to all. I can’t believe you’re baking the same day. Stollen. Just in time. I’ve got the osmotolerant yeast and was going to make Panetone or Pandoro but this will do. I also have candied fruits from King Arthur Flour that I’ve been looking to do something with. Yesterday my Mom and I practiced adventures with authentic German pretzels right down to using food grade lye. We were very careful but the results were worth the effort. We’re doing it again on Saturday so she can have fresh pretzels for Christmas. Not a fan of fruitcake but my Mom loves stollen. Between this and the pretzels she is going to remember this Christmas for a long time. Thanks and joy to you both. Thank you for sharing your baking knowledge with us! I will try your recipe for Stollen this year. I like to make several small ones to give as gifts. I love the reference to the swaddled Christ child, just love this! I have to be honest. 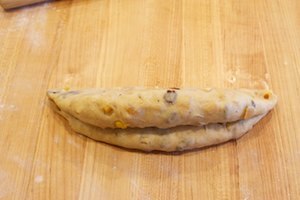 I quit reading about the Stollen and dashed through the recipe simply so I could wish you, and yours, the most wonderful journey of a lifetime! Such a happy day for you! All the best- may your marriage be filled with love and happiness!! Best wishes to you. I hope the day is one of a kind! Congratulations! Best Wishes! All that!!!! And gorgeous stollen on top of it all. 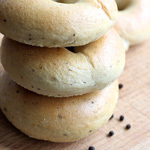 Love this fantastic website, full of beautiful breads! I only wish that you would include volume measurements as that’s all I can use. I do not have nor can I afford a scale as I live on SS alone. But I love to bake and it’s too hard figuring out the amounts in cups etc. Though I know it’s not exactly pc, or should I say bread-baking correct, would you please consider doing this? 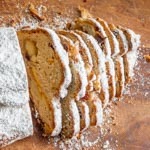 Stollen is something I make every year and would love to use this recipe. Keep up the wonderful work and Merry Christmas! Oh, my goodness, had not read you are getting married! Congratulations to you! Hope your day was as special as this Stollen Susan. This truly is the very best stollen I’ve ever had. Totally love the candied orange peel. Love it so much so, tomorrow I’ll be doing my third batch. Congratulations. What wonderful news. I hope you had a lovely day, and it was everything you imagined. What a special first Christmas this would be for you! What wonderful news! Congratulations and the warmest wishes for love, joy, days bright with sunshine and smiles, and yes, some fresh bread, too. Your stollen looks beautiful, btw. Congratulation for a new chapter of your life ! How I wish I can have this stollen for breakfast ! I would like to try to make it one day ! First, congrats on the nuptuials. Second, do you agree with putting Marzipan in the center of the bread roll? Would like your opinion since I am making the bread this weekend. Followed the recipe and got so many compliments at work about the bread. Since I am a man working as a teacher, many of my counterparts thought that I had help from the wife. Well, such is life. Know what I mean? Happy Christmas Susan. I made this stollen today and it turned out great. Thanks you for the recipe and instructions.